Nike Basketball recently talked about China’s passion for the game of baketball, focusing on the fact that they play primarily outdoors. With outdoor play being a focal point they unexpectedly unveiled their new upcoming models. 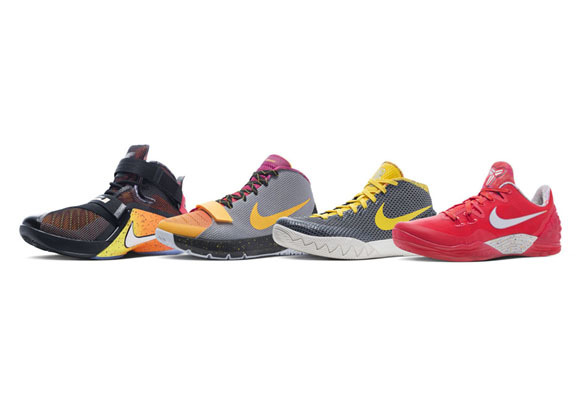 The Nike Zoom Venomenon 5 & KD Trey 5 III were shown – which are outdoor specific – alongside the Zoom Soldier 9 & Kyrie 1 that feature XDR outsoles. XDR is standard with China releases as they all come with them. Here in the US you’d need to order a NIKEiD version of the shoe if you wanted a more durable rubber option. As for the shoes… we’ve seen the Venomenon 5 before, but this Red version looks much nicer than any previously seen colorway. I’m not a fan of the aesthetics on the model so keeping things neutral with a tonal upper was a good choice. Then there is the KD Trey 5 III. Those are… interesting to say the least. They definitely look more comfortable than that last version, more breathable as well, but they sure do look funny. Almost like a training shoe than a hoop shoe. No word on release dates or even if they will be available in the US this year. US residents have this way of complaining about not having outdoor options available, then when they get those options they’ve been complaining about it just isn’t good enough which means the shoe sits. If the shoe sits, then people in the US don’t really want an outdoor shoe. Yes, I know. It’s kind of crazy. Check out the kicks below, and share your thoughts on them in the comment section. Hopefully we’ll know for sure if/ when these could hit Stateside. that kyrie 1 looks real nice, but c’mon now, who thought it would be a good idea to have everything white from the midsole down, a white heel counter, etc.? the coolest part of the kyrie 1 is the sharktooth midsole with two colors on the top and bottom, why ruin it? actually, that heel counter might be grey, didn’t look at it closely enough….but still! I have the Kd Trey V 2 and they’re the worst performing shoes I’ve had in years. The cushion is non-existent. You would think to ball outside on that hard pavement that Nike would concentrate on traction AND cushioning. I just pick up any good performing shoe that is on clearance for under 60$, use it until the tread is gone and grab a new pair. Sure they don’t last too long, but it’s better than dropping 150+ on nikeid xdr soled shoes. I grabbed 2 pairs of the Zoom Crusader(the outdoor model with xdr) and 2 of the Run the One’s, each pair was around 40$ shipped. I’ve nearly burned through my first pair of the Run the One’s and they have about 36hrs of hard play in them. I’ll get probably another 4hrs in them, so for 1$ an hour I had a great performing outdoor shoe. Hit those discounts and don’t worry about burning up a pair, there will always be another one. Sure they go bald fast, but up here in Oakland the courts are rough enough where bald shoes stick like glue. I hope they make the Zoom Soldier 9 XDR available for us in the USA. Does anyone know what store over seas would carry these Solider 9 XDR? I think they look cool, hope they come here soon. Hi, well I’m from India and here too we predominantly play in outdoors. My court is especially rough, certain abrasions if you fall kind of rough. Most of the shoes available offline and online are either very cheap low end models that last like the overplays and air visi pro, or performance models like hyperdunk and superfly that barely last 2 months. I found an ambassador 7 last year and that has lasted almost 6 to 7 months (2 to 3 hrs a day) of court time and that’s pretty impressive. But they made my feet hurt like bad. I would need a few days to adjust to the pain and then it’s fine till I stop playing for a few days. Then I would need to readjustto the pain. Then I read the review on prime hype df and bought a pair and it has lasted a month and seems like it will last 3 more months. So I bought two more. For next year. Since they went out of stock pretty soon.